This entry was posted on January 30, 2018 by Jessica Anderson. Less than a week until the biggest football day of the year - SUPER BOWL SUNDAY! Want to enjoy the game, the ads, and the half-time show with friends and family? Then throw a party with a contest! Football and competition go hand-in-hand and a Superbowl party is the perfect opportunity to share football, food, drinks, and a little friendly competition. Football Pool. Have party attendees buy squares and then assign numbers to the squares for the score after each of the quarters and the end of the game. Prop Bet. Who will win the coin toss? Which team will score first? Will Gronk do an end-zone dance? These are all fun things you can bet on that only require luck! Chili Cook-off. Have your family and friends bring their chili in a crock pot for blind tasting. Read my past blog on how to host a chili cook off. Don't forget the prizes, such as chili medals, blue ribbons and chili cookoff trophies for your winners! Fantasy Football Awards. Superbowl Sunday is the perfect day to award you fantasy football league winner and haze your league loser. Bring your perpetual fantasy football trophy to pass to the champ and an engraved toilet trophy for the league loser. 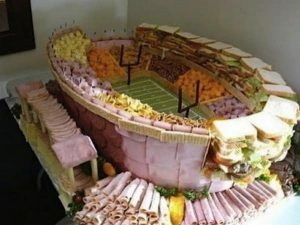 A sweet stadium made of snacks, get the idea on Pinterest! Cute Decorations. Decorate in your favorite team's colors and include one of our Championship Trophies, that looks like a Lombardi trophy, for your table centerpiece. This could go home with the big winner of your Football Pool. Snacks: Chips and salsa, guacamole, nachos, cheese or bean dip, garlic bread, and cornbread all go great with chili. Cut up veggies with ranch or even a salad balance out the other junk so at least your guests get a little something healthy. Check out our Pinterest page for great game day snack ideas! Dessert: I personally like cookies, brownies, cupcakes - things you can eat with your hands, to keep dishes at a minimum. 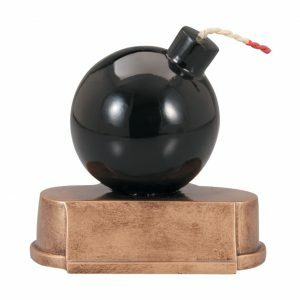 For someone who blows up the game, award our popular bomb trophy! Drinks: Beer, lots of it. Conserve fridge space and have a cooler with ice for the beer. Awards: To add some laughs at the party, I’d recommend one of our funnier trophies. Two of my favorites are The Golden Throne and The Bomb Trophy . 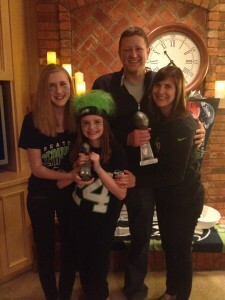 The Superbowl is a great excuse to get together with family and friends, and hosting a competition is sure to bring an unique twist to your party. But no matter what, Superbowl Sunday is all about hanging out with family and friends and enjoying the best commercials of the year!